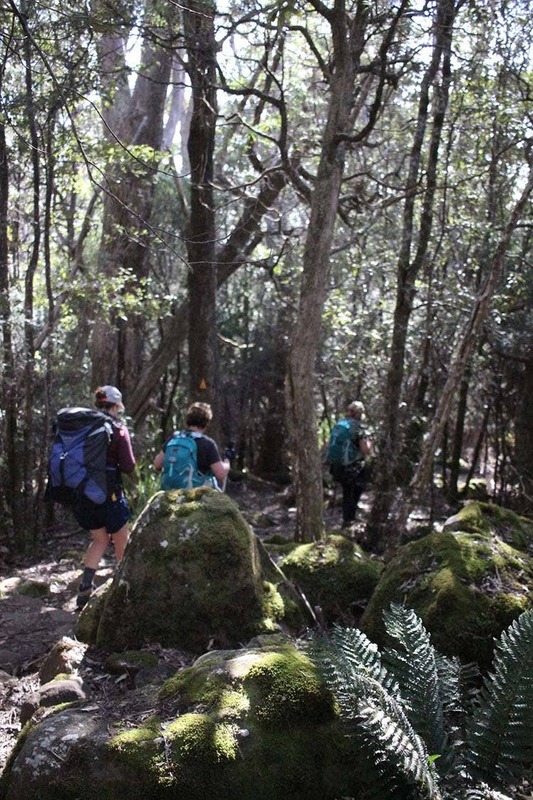 If you’ve ever wanted to explore some of Australia’s most wild and spectacular scenery, but are less than keen to carry your bed and shelter along the way – the Three Capes Track is the perfect outdoor adventure for you. 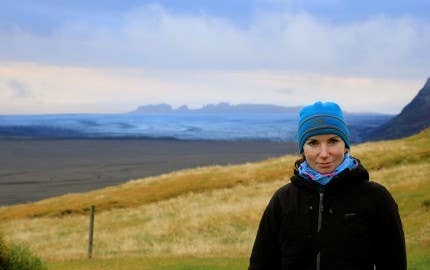 Hiking among the tallest sea cliffs in the Southern Hemisphere, we can guarantee that you’ll be stopping around every bend to take another photo. 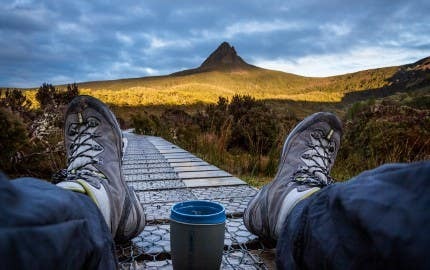 The track, set atop a rugged coast of Jurassic-era giant dolerite pillars, is without a doubt a world-class hiking destination. Dolerite cliffs on the southern coast of the Tasman Peninsula. Photo by Alice Winton. Stretched over 4 days, you’ll be treated to a scenic boat ride to the trailhead beginning at a golden beach, serviced huts you’ll enjoy each night, a wealth of natural wonders spanning landscapes, animal and plant life. You’re also handed a well set out guide book, that is worth opening! There are seats along the trail that link to each page and tell you some very interesting facts about where you are sitting. The distances are very achievable, but it’s a good idea to gauge how quickly or slowly you are travelling in relation to the estimated walking time each day, that way you can adjust for the following day. You don’t want to be getting into a hut after dark but you don’t want to be rushing either. 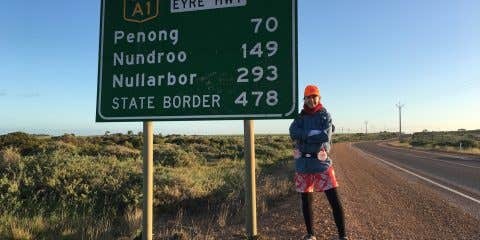 The walking guide is based on moderately fit walkers travelling at a comfortable pace, so if you’re a little slower or like to stop a lot (photos, breath-taking view breaks, flora & fauna spotting, morning tea on the trail, another photo) perhaps allow yourself the longer time frame, or even an extra hour – there is so much to enjoy! Cruise to the trail head. 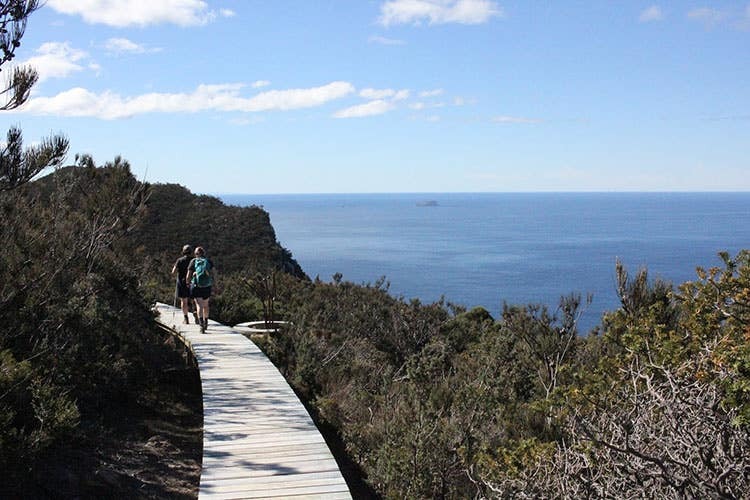 Walk through eucalypt woodland until you reach Surveyors cabin, where you’ll be blown away with the views of Cape Raoul. Short climb to Arthur’s Peak (amazing views of Crescent Bay), crossing Ellarwey Valley to reach Munro cabin. From here you can enjoy dramatic views of the Munro Bight and Cape Hauy. 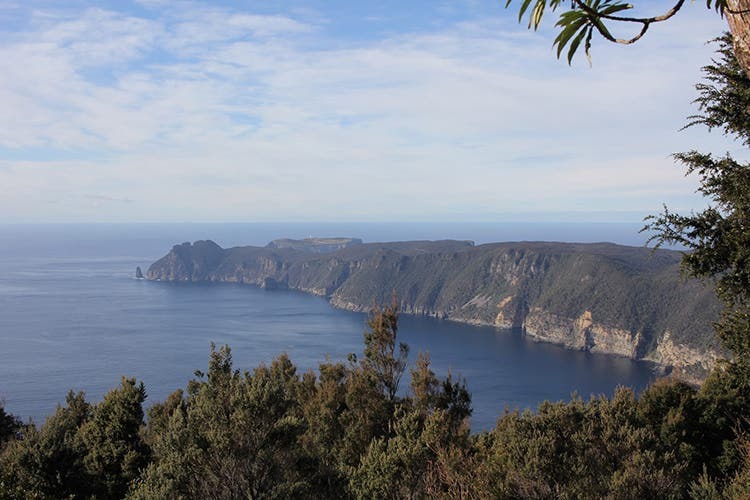 Carefully make your way to the tip of The Blade at Cape Pillar, with sea cliffs plummeting down either side and unobstructed views of Tasman Island ahead. 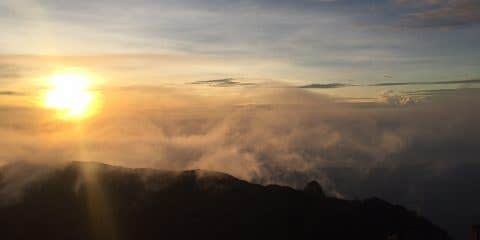 This is guaranteed to confirm why this hike and its surrounds are an adventure destination people flock to from all over the globe. The track loops back to Munro, meaning you can dump your heavy packs and take a day pack with you for this section. You’ll end your day at the Retakunna cabin. The final climb, Mount Fortescue, is the last bit of tough work before being rewarded with the views out at the tip of Cape Hauy. You’ll spot the famous climbing feat: Totem Pole and other dolerite columns. From here, it’s mostly downhill until you hit the shores of Fortescue Bay – by this time you’ll have earned a refreshing swim! Day 3 on Three Capes Track, views into the Tasman Sea. Photo credit: Alice Winton. Gear pictured: Osprey Tempest 20L pack, Komperdell C3 walking poles. Days 3 and 4 are the longest days. Day 3 is longer now with the extending of the trail all the way to end of Cape Pillar (this is now 19km over the day – even though you’ll see on some resources it’s still marked as 17km). This day you’ll be getting up close and personal with some of the most spectacular cliffs-drops of the whole walk, where there are no guard rails. 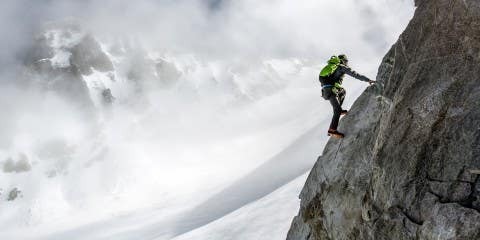 For anyone who is not the best with heights, you’re safe to stick to the trail, there’s at least 2m to the edge so you don’t have to look down. It’s not all 300m cliff drops. There is a section of boardwalk that winds you 2.4kms over the top of banksia and sheoaks, and has the shape of a snake. There’s a subtropical rainforest that has its own climate. All of the rocks on the trail are colour coordinated in their natural orange and grey to define the path, and have been placed by hand. There are 11 ochre handprints to find, placed on trees and rocks by members of the Tasmanian Aboriginal community. There is so much more than what made it into the brochure! Day 4 has more stairs than you expect. 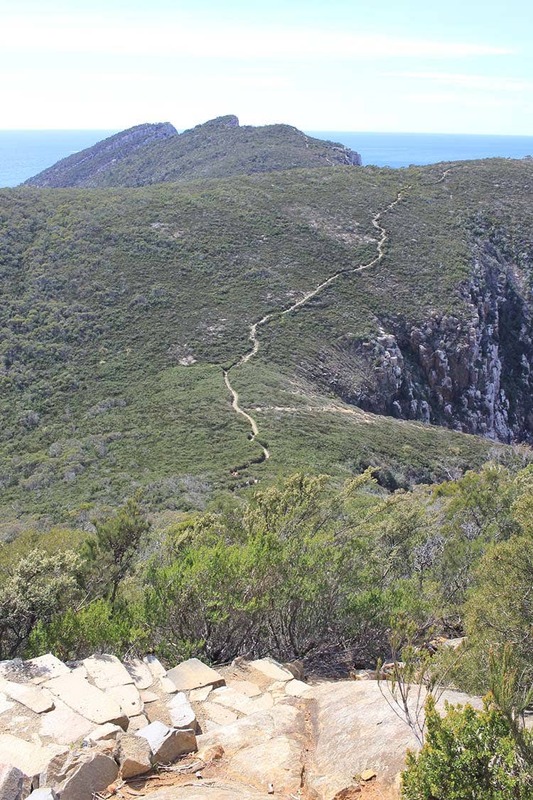 There’s the summit of Mount Fortescue, descending the other side, there’s the hike out to Cape Hauy (and back), and there’s the descent back down to sea-level at Fortescue Bay. The right gear will make this day in particular a lot more enjoyable. Good hiking shoes or trail runners will give you grip without being too heavy – make sure you get fitted properly for your feet are doing most of the work. 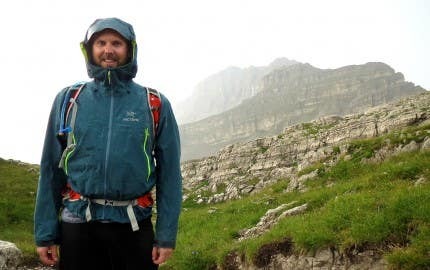 Paddy Pallin Staff Pro Tip: trekking poles take around 20% of your combined body and pack weight off your ankles, knees and hips. Plus they give you added stability going up & down hill. Learn more about trekking poles here. Your first port of call should be the Three Capes Track website where you’ll find a breakdown of all the need-to-know basics as well as FAQ, Gallery & how to book. 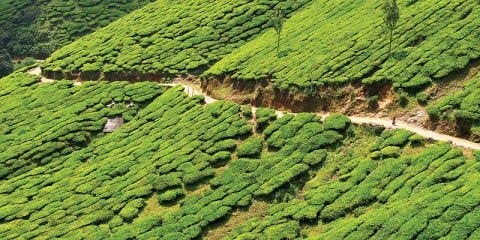 There had been some initial backlash about the cost of the walk – it’s $495pp – but consider for a moment that the trail took 17,400 helicopter flights to carry in building materials and nearly all of the track was built by hand to maintain the natural environment, and it set them back a whopping $25m to complete. And on the bright side everyone who has completed the walk (myself included) says it is worth every dollar! Your booking fee covers your accommodation for the 3 nights on the track, your guided boat tour to the trail head and 25-min bus ride back to Port Arthur at the end, as well as 2-years entry into Port Arthur Historic Sites (which is a nice perk as it’s nearly impossible to see everything there on the morning before you board the boat). All times of year is spectacular for different reasons. Spring: (September – November) Whale migrations, and spring flowers in bloom. Summer: (December – February) The international Sydney to Hobart Yacht Race passes by the capes. Autumn: (March – May) Whales are migrating back again! As well as Short-tailed Shearwaters annual migration, and orchards in bloom. Winter: (June – August) Acacia trees in bloom, night skies at their clearest, crashing winter swells, and less people on the trail. Equipped with everything you could want on a trail – kitchens with gas cook-tops, memory foam mattresses, heating for those cold nights, and sprawling deck space for lounging on sunny afternoons, there are even USB charging stations and a shower at the second hut. A ranger is stationed at each hut to brief you on the next day’s weather, what to expect on the trail ahead, and any furry “locals” to keep an eye out for (there’s a resident Wombat who lives at the third hut, Retakunna). The seating areas inside the huts are limited once the sun has set, so don’t forget your hut etiquette – it’s a shared space, not first come first served – no holding seats for invisible friends, folks. Also there’s a no boots inside policy, so you’ll want to pack an alternative for the kitchens and the midnight trip to the toilets. Hut booties are great for the cooler months or the classic Aussie thongs – just remember you have to carry it, so maybe forego the clunky Ugg Boots. The bookshelves are stocked with reading material, which is the same at each hut – so if you start reading a book, you can continue reading it the next night! The sleeping quarters are shared, and most people are up early to see the sunrise (especially at Munro hut – see if you can spot a whale! They’re migrating in Spring and Autumn), but if you like your beauty sleep the huts provide ear plugs too! You’ll need to carry out all the rubbish you take on the walk with you, but each hut has a compost bin so you can dump your food scraps each night to lighten your pack. Day 4 on Three Capes Track, Mount Fortenscue. Photo by Alice Winton. Gear pictured: Osprey Tempest 20L packs, Patagonia Cap, Marmot Scree Pants. A packing-list is a great way to see that you have the essential outdoor gear that you’ll need. You can also stop by a Paddy Pallin store to have a chat with the friendly staff – quite a few have done this hike. 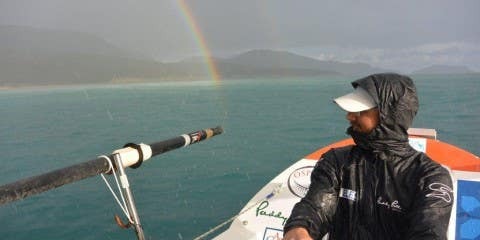 In true Tassie form you’ll need to pack for cold weather, wet weather and don’t forget your sunscreen! You’ll want to be prepared for the cold wind on the capes, but out of the wind it can get blisteringly hot when the sun is out. Ask staff how you can lighten your pack and still take everything you may need. It’s not full glamping on this trip, you will still need to carry in your sleeping bag, and your food (and, yes, the wine!) 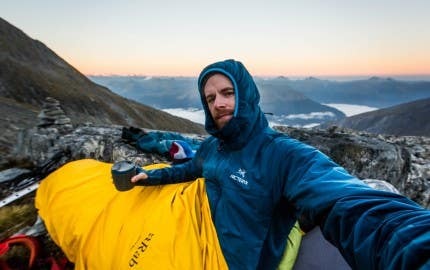 so you’ll need to make sure you have a comfortable backpack that will fit these – 50 L should be enough (even if you’re committed to dining gourmet every night), but make sure the pack fits you properly. Your back and your feet will be worked, treat ‘em right. A packable towel – there’s a shower at one hut, and it’s tradition to go for a swim at Fortescue Bay! Sun protection – the Tasmanian sun is surprisingly harsh. 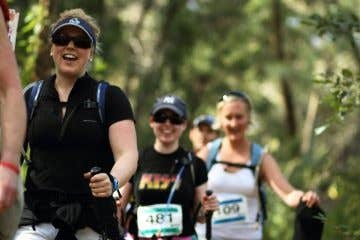 Whether it’s a hat, sunnies, or sunscreen, make sure you’ve got it handy on your walk. Take snacks! And keep 1-2 handy in a pocket. Trekking poles – they save your knees on the stairs! Paddy Pallin Staff Pro Tip: Your first day is only 4kms, so don’t be afraid to carry in something special to enjoy on the first night. Check the weather forecast in the days before you go. Make sure you check the weather in Port Arthur, not Hobart, often the weather in Hobart doesn’t hit the Tasman Peninsula, and there can be a few degrees difference too. And don’t forget to get out on some practice/prep walks before you head out on the trail. Day 4 on Three Capes Track. Photo by Alice Winton. The closest major airport is in Hobart. From there it’s about 90 mins drive to Port Arthur. 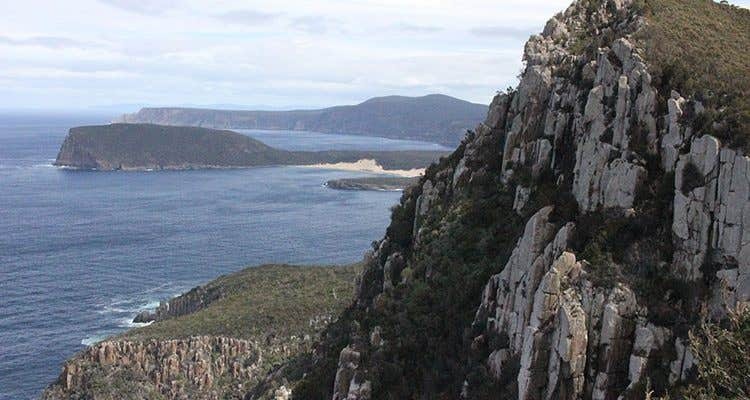 Driving: There is a Three Capes Track (long term) car park at Port Arthur for anyone booked in to the walk, at no extra cost. 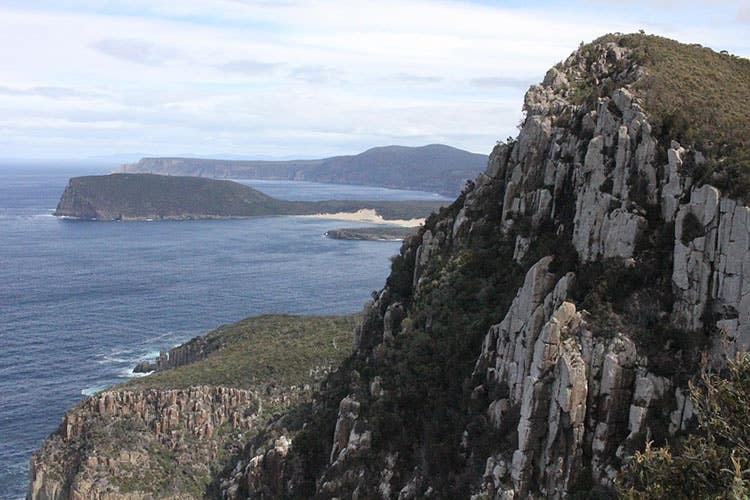 Day 4 on Three Capes Track, view of Cape Pillar from Mount Fortescue. Photo credit: Alice Winton. EXCITING NEWS! Paddy Pallin has opened up a new store in Hobart. 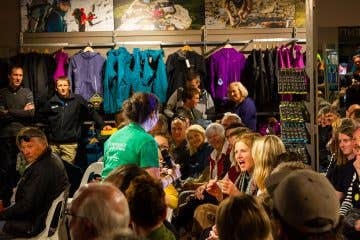 We’re thrilled to join this adventure community teeming with outdoor enthusiasts, conservationists, and generations of explorers. Come say hello at 111 Elizabeth St. 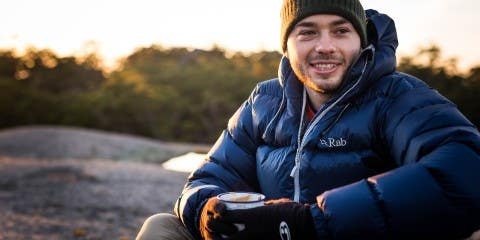 Whether you’re a Tassie local, or visiting Hobart as a jumping off point for outdoor adventure, make sure to stop in to Paddy’s for all your outdoor gear needs.